We’d love your help. Let us know what’s wrong with this preview of His Convenient Highland Wedding by Janice Preston. To ask other readers questions about His Convenient Highland Wedding, please sign up. In the interests of transparency I should start with a disclaimer that I have an interest in this book because I'm one of the other authors involved in the Lochmore Legacy continuity. HOWEVER - this in no way colours my opinion of this book (other than a staggering sense of relief that it is so damn good and means readers will be gagging for the next one in the series). Married for the money he'll bring to her family and the access to society she'll bring him, Lachlan and Flora make an appealing In the interests of transparency I should start with a disclaimer that I have an interest in this book because I'm one of the other authors involved in the Lochmore Legacy continuity. HOWEVER - this in no way colours my opinion of this book (other than a staggering sense of relief that it is so damn good and means readers will be gagging for the next one in the series). For me this is one of those books, that is a definite page turner and I just loved everyone in the book, well apart from Flora's parents, Wow Janice Preston has definitely got this series off to a brilliant start. I mean who doesn't love Scotland, the way Ms Preston described the scenery I could see it in my head, it was like seeing a photo. And we have men in kilts, and who doesn't like that. From the moment Lachlan and Flora first meet oh my goodness the chemistry between them is just electric. Oh my goodness, what an emotional read this is! I think I experienced every moment of Flora's loneliness, her sadness, and her discouragement at her predicament. Lachlan is a decent man, but he is just not present. he doesn't know how to act with her, what to say. He feels undeserving of such a lovely woman; he doesn't want to scare her away, so he avoids her, leaving her even more distraught. Janice Preston has created a remarkable gothic atmosphere, suited to Flora's every state of mind. Her attempts to get closer to her husband are in vain; he is always occupied, and he has secret business to attend to. Flora tries and tries, but nothing seems to work. From disillusioned, she grows angry, resentful, until an opportunity presents itself, and hopes she might have glimpsed the light at the end of the tunnel. Ms. Preston's extensive research paints a vivid and realistic portrait of Victorian society, very Dickensian, highlighting the chasm between the classes; the generally appalling treatment of labourers and women; the growing poverty affecting the common people. And all this is essential to the romance in HIS CONVENIENT HIGHLAND WEDDING, because it is what eventually brings Flora and Lachlan closer. I also loved the inclusion of a legendary composer because of the stunning historical accuracy of the fact, and because he is one of my favourite artists. It's easy to understand why Lachlan wants to conceal his past; it is a huge secret, but I had no doubt that Flora would accept it with grace. HIS CONVENIENT HIGHLAND WEDDING is supremely compelling, intense, powerful, and slightly unsettling because of how well every feeling is conveyed. This richly textured novel offers not only a wonderful romance - and a hard-earned happily ever after - but also a world so convincing and well drawn, that Ms. Preston could build a whole series based on her extraordinary characters and their tribulations. Now, I can hardly wait to go back in time, and learn more about The Lochmore Legacy, and the brooch. What a fabulous start to what promises to be a very exciting series! His Convenient Highland Wedding by Janice Preston is the first in a new series “The Lochmore Legacy”. I’ve been anxiously waiting for this series to start since I first heard about it some time ago. What makes this series unique is that there are 4 authors involved and they will each be writing in a different time period going back in time to unravel a mystery. Janice Preston starts us off in the Victorian Era. Lara Temple follows in book 2 with a Regency. Elisabeth Hobbes will have a Tudor stor His Convenient Highland Wedding by Janice Preston is the first in a new series “The Lochmore Legacy”. I’ve been anxiously waiting for this series to start since I first heard about it some time ago. What makes this series unique is that there are 4 authors involved and they will each be writing in a different time period going back in time to unravel a mystery. Janice Preston starts us off in the Victorian Era. Lara Temple follows in book 2 with a Regency. Elisabeth Hobbes will have a Tudor story in book 3. Then finally Nicole Locke will give us a Medieval in the 4th and last book in the series. Each story will be centered around a Scottish Castle. Flora McCrieff is the heroine in this particular story. She is the eldest daughter of an impoverished Earl. Her father is a tyrant who expects his family to bend to his demands. So when her father tells her she will wed a man she’s never seen in two days, she really has no other choice. Lachlan McNeill grew up in the slums of Glasgow. He’s now a rich businessman who is looking for connections to help grow his new whisky distillery. He arranges to wed Flora sight unseen hoping that by marrying a lady of the aristocracy it will help ease his way into Scottish society. I really loved Flora and Lachlan from the start and was caught up in their story. They are good people but complete strangers when they marry. So there are lots of struggles to talk and communicate in the beginning. They both want more from their marriage but struggle with their insecurities to admit it to each other. It was evident there was an attraction from the beginning and I like that author Janice Preston gave this couple time to get to know and trust each other, letting their love grow gradually. Janice Preston is a virtuoso of words. She magically transforms her characters with such skill that mesmerizes you in an instant. His Convenient Highland Wedding is a story of family, scandal and fortune. It encompasses pain, growth and passion. It is reliably entertaining and masterfully crafted and I couldn’t help but get lost in the journey Lachlan, Flora and the vibrant secondary cast took me on. A stellar read from start to end! Janice Preston is on fire! This was one of the best books I’ve read this year. The overreaching arc is something that interested me about this series and it didn’t disappoint. I am on the edge of my seat to see where this story will go. I just adored both the heroine and hero — especially the hero. Lachlan has ruined me for all men be them real or in books. He’s just such a well written character, born of low birth but with the ambition to rise from his past he really did pull at my heartstrings. Janice Preston is on fire! This was one of the best books I’ve read this year. The overreaching arc is something that interested me about this series and it didn’t disappoint. I am on the edge of my seat to see where this story will go. I just adored both the heroine and hero — especially the hero. Lachlan has ruined me for all men be them real or in books. He’s just such a well written character, born of low birth but with the ambition to rise from his past he really did pull at my heartstrings. He was the kind of character you root for, the one you want everything for. I love it when author’s go out o Oh, my goodness me!! This is ridiculously good. No, good isn’t the right word to describe just how brilliant this book is; definitely more along the lines of sensational. I shouldn’t be surprised seeing who the author is, Ms Preston is a favourite author of mine, I knew that I would be in for a great story, but this is really something special, and I can honestly say that this is my favourite of all of Ms Preston’s work, it really is astonishing how good this is. Businessman Lachlan McNeill – oh, be still my beating heart! – is trying to get his newly founded Whisky brewery up and running, he is confident that his new blend will become a great whiskey. There is just one thing standing in his way, and that is who is. He is a self-made man, new money as some call him and not an aristocrat – can you see why I am so much in love with this guy? He is a man who has a troubled and dark past – one of which he is deeply ashamed of and one which he knows if society ever found out about his business would probably fail. He hides his past and plans to get himself a patron, an up standing man of society who will be able to help, but to get that he needs a wife with some clout. Which is why he marries Lady Flora. Because His Convenient Highland Wedding is the first of a four-book, four-author series centring around a mystery, Preston’s novel opens with a silly scene of the heroine’s discovery of a creepy tow Though I’m suspicious of new-to-me authors, I was willing to give Janice Preston a try because: a) MOC is my favourite trope and b) the word “highland” in the title always evokes a frisson of excitement and anticipation. What I found was an enjoyable, uneven romance. But, first, to the plotty details! I have only recently started to read historical Mills and Boon mainly due to local author Elisabeth Hobbs who is an amazing writer of books that are full to the brim with realistic characters and authentic historical detailing, not to mention some beautifully crafted relationships. When I heard that her latest book was to be part of a series called The Lochmore Legacy, I was intrigued enough to want to read ALL the books in the series and not just hers! And so I have started at the beginning wit I have only recently started to read historical Mills and Boon mainly due to local author Elisabeth Hobbs who is an amazing writer of books that are full to the brim with realistic characters and authentic historical detailing, not to mention some beautifully crafted relationships. When I heard that her latest book was to be part of a series called The Lochmore Legacy, I was intrigued enough to want to read ALL the books in the series and not just hers! And so I have started at the beginning with His Convenient Highland Wedding by Janice Preston. Flora McCrieff is forced to marry her fathers choice of husband after she brings disgrace on their family name. The marriage brings financial security to the McCrieffs and a place in society for her new groom. Lachlan McNeill is a gorgeous man but one of few words and many secrets which becomes apparent after their wedding night when he retreats into a world that Flora knows nothing about. What could he be hiding and will it affect the growing attraction between them? Well now, what’s not to love about this book?! And did I already mention the Scotsman??!! Seriously, I was sucked into this period romance from the very first chapter and thoroughly enjoyed every moment! There’s an interesting discovery by Flora very early on in the book that I think will be mentioned more as the series progresses and I’m already very intrigued. Flora meets with characters that have fascinating backstories and I can’t wait to read about them in future books. But back to Flora and Lachlan! Their relationship was a gradually developed liaison that sizzled with anticipation and I was rooting for them to put aside their misunderstandings and become the perfect match that I knew they were destined to be. I actually read the whole book on the train where it took me on a journey of discovery far more exciting than the countryside I was passing through! And I fell in love myself, not just with Flora and Lachlan, but also with Janice Preston’s writing and I’m now going to check out her previous books as well. Lachlan McNeill May be insanely rich, but he came from a lowly status. When he weds an Earl’s daughter, Flora McCrieff, he knows having her on his arm will open a lot of doors for him. Flora once denied a Duke, and now she is married to Lachlan. Flora desperately wants love and family, and truly hopes that being bound to Lachlan will fulfill those desires. It is business first for Lachlan - mostly. He has another serious matter that also requires his time and attention. With everything going on f Lachlan McNeill May be insanely rich, but he came from a lowly status. When he weds an Earl’s daughter, Flora McCrieff, he knows having her on his arm will open a lot of doors for him. Flora once denied a Duke, and now she is married to Lachlan. Flora desperately wants love and family, and truly hopes that being bound to Lachlan will fulfill those desires. It is business first for Lachlan - mostly. He has another serious matter that also requires his time and attention. With everything going on for him, he has very little room for emotion. Also, Lachlan has experienced a difficult and painful past and this he feels he must keep secret from Flora. As things progress, Flora and Lachlan eventually draw together, but it was never easy for them to do. They both have amazing strengths and it will take some doing for each of them to realize that. Kudos to Janice Preston for writing such powerful characters. This touching story introduced deep and abiding live to two deserving people. Meanwhile the importance of family easily flowed throughout the pages. All in all this was a marvelous read, and a great start for what is certain to be a promising series. His Convenient Highland Wedding is the first book in the Lochmore Legacy series. Interestingly, these books take pace across different eras. The other titles are, in order - Book 2, Unlaced by the Highland Duke by Lara Temple, Book 3, A Runaway Bride for the Highlander by Elisabeth Hobbes and Book 4, Secrets of a Highland Warrior by Nicole Locke. This is the first book in the The Lochmore Legacy series, which centres on Lochmore Castle through the ages! Earl’s daughter Flora McCrieff brought shame on her family once when she refused to marry a lecherous Duke, now she discovers she must enter a marriage of convenience with the impossibly rich but low born Lachlan McNeill. Following their wedding they return to his home Lochmore Castle which he bought a year ago. I was drawn into the book from the prologue when Flora was a girl & disco This is the first book in the The Lochmore Legacy series, which centres on Lochmore Castle through the ages! Earl’s daughter Flora McCrieff brought shame on her family once when she refused to marry a lecherous Duke, now she discovers she must enter a marriage of convenience with the impossibly rich but low born Lachlan McNeill. Following their wedding they return to his home Lochmore Castle which he bought a year ago. I was drawn into the book from the prologue when Flora was a girl & discovered a skeleton & brooch in a locked tower of her family home. An engrossing read with a well written story that flows effortlessly. The characters are well rounded & have plenty of depth. I adored both Flora & Lachlan, she's the strong lady who’s intelligent & caring but also insecure, Lachlan whilst he's the brilliant businessman & is a self made man he’s also very protective but insecure. I loved how their relationship grew throughout the book from strangers who meet for the first time at the altar to true partners. The book took me through a gamut of emotions & my heart bled for Flora’s treatment by so called Ladies & also bled for all Lachlan & Anna had suffered. There is the mystery of the brooch which wasn't resolved & which makes me want to read the rest of the series one book after another & will be counting the days until the next book releases. Well I was sat here thinking about how to write this review and I just kept on smiling because that is how gorgeous this story was. I was instantly transported to Scotland and it really made for a stunning setting as we meet Flora and Lachlan. Their first meeting is unusual but even from that first moment there is a wonderful chemistry between the pair which is built perfectly throughout by Janice Preston. Flora has such a warm and likeable personality along with a determined edge, I couldn’t he Well I was sat here thinking about how to write this review and I just kept on smiling because that is how gorgeous this story was. I was instantly transported to Scotland and it really made for a stunning setting as we meet Flora and Lachlan. Their first meeting is unusual but even from that first moment there is a wonderful chemistry between the pair which is built perfectly throughout by Janice Preston. Flora has such a warm and likeable personality along with a determined edge, I couldn’t help but root for her! Then add in Lachlan to the mix he is determined, brooding (sigh) and has a past that isn’t perfect. I really am trying to be vague about the plot but you really do get the most romantic story. It was made even more perfect as Janice Preston’s inspiration for the character is Richard Armitage. The fact that there is a mystery running throughout this book and the following books in the series is a big positive for me. It was perfectly set up to make me very curious and I can’t wait to see how it will all play out in the series. However at the same time I loved Flora and Lachlan’s story how they slowly but surely built up a tentative friendship along with a chemistry that felt realistic and wasn’t rushed but carefully shown. I loved the way that this book also involved family whether it was estranged or lost. The minor characters all play an important part in this story along with some brilliant snippets of history that are perfectly placed. Terrific start to the new series. I was hooked from the beginning and read the book in one sitting. It opened with a young Flora, frustrated by her father's attitude toward her, dealing with her frustration by exploring an area of her home that was expressly forbidden. She paid for that disobedience with the horrifying discovery of a skeleton hidden in the tower and was unable to talk about it for fear of the repercussions. Two things she brought away from the experience was a silver brooch foun Terrific start to the new series. I was hooked from the beginning and read the book in one sitting. It opened with a young Flora, frustrated by her father's attitude toward her, dealing with her frustration by exploring an area of her home that was expressly forbidden. She paid for that disobedience with the horrifying discovery of a skeleton hidden in the tower and was unable to talk about it for fear of the repercussions. Two things she brought away from the experience was a silver brooch found on the skeleton's clothing, and the need to find out more about it. There was a touch of the eerie in the emotions that Flora felt upon the discovery of the skeleton and again when contemplating the brooch. Fast forward seven years. Flora was on the way to her wedding to a man she had never met, her father's attempt to repair the family fortunes. After the scandal she caused the previous year when she publicly refused to marry a duke, Flora was given no choice in this marriage. The guilt she felt overpowered her objections, and she desperately hoped that going through with the wedding would repair her relationship with her family. Waiting for her at the altar was Lachlan O'Neill. Born in poverty, with tragedy and secrets in his past, Lachlan was now a very wealthy man. He had plans for his new whisky distillery and felt that marriage to the daughter of an earl would open doors to the upper echelons of society. Stunned by Flora's beauty and delicacy, he was suddenly filled with self-doubt. The path to a happy future was not an easy one for Flora and Lachlan. While there was no doubt about the sparks of attraction that flew between them, both Flora and Lachlan suffered from crippling bouts of insecurity. Lachlan often felt like a bumbling, uncultured oaf around her, which caused him to withdraw into himself and hide behind his business. This caused Flora to believe that she was lacking in any number of ways, which fed her feelings of worthlessness. I ached for them on their wedding night, as what could have been the beginning of true intimacy was made awkward by the horrible advice Flora received from her mother and Lachlan's feelings of inadequacy. Away from the strictures of her father, Flora slowly began to assert herself. I loved seeing her face up to Lachlan and let him know what she needed. Afraid of doing the wrong things, Lachlan erred on the side of caution. I enjoyed his surprise and relief when Flora showed interest in his work. Their first foray into society after their marriage did not go well. Flora's past transgressions were neither forgiven nor forgotten. Her inability to hold up her part of the bargain with Lachlan devastated her. I loved Lachlan's understanding and support when she confessed to the problem. This also gave Flora hope for the future of their marriage. The sparks of attraction continued to grow, but it seemed that every time they made progress, something would interrupt them. I ached for Flora as, time after time, Lachlan would leave her hurt and frustrated. I wanted to shake Lachlan for not telling her the truth behind those interruptions. An unexpected visit and some timely advice gave Flora the confidence to make some changes. I loved seeing Flora come into her own as her confidence grew. The dinner with her aunt and uncle was a prime example of what was possible with confidence and thinking outside the box. I especially enjoyed Flora's dedication to Lachlan's plans, and determination to be an asset. I enjoyed Lachlan's hint of jealousy, then his astonishment and approval of Flora's initiative. I was so frustrated with Lachlan's refusal to come clean with Flora about his past. His constant retreats added to Flora's unhappiness and fears until she finally stood up for herself and what she wanted from her marriage. That strength and confidence and persistence finally broke through Lachlan's walls. His confessions of all that he'd been through were heartbreaking and emotional, as was his fear of Flora's reaction. Her compassion and understanding were not what he expected, and I loved seeing the difference it made. He wasn't completely clear of his demons, however, and family-induced stubbornness nearly derailed his progress. Flora also made progress with her own family, her newfound strength giving her the confidence to face them all. The scene with her father was awesome. I loved the surprise she arranged for Lachlan for Hogmanay, and the follow-on epilogue was excellent. One of the things I really enjoyed about this book was the look at the lifestyles of the period. Instead of just seeing the upper classes, a lot of time was spent on the social problems of the day. I especially liked how Lachlan's experiences influenced his actions as a business owner. Flora had been quite sheltered and the things she learned after her marriage were eye-opening. The change from typical earl's daughter to a supporter of social justice was a moving one. I liked the support and encouragement she received from both Lachlan and her aunt at the dinner in Glasgow. The Lochmore Legacy series begins with this excellent opener from Janice Preston. Flora McCrieff has never met Lachlan McNeill, and doesn’t even know his name until she meets him at the altar on their wedding day. Having rejected a proposal from the Duke of Galkirk the year before, Flora’s father, desperate for financial aid, arranges for his eldest daughter to marry successful businessman Lachlan on the promise of him providing dowries for his other daughters. In spite of this strange start to their relationship, Janice Preston’s writing style means that these wonderful, well created characters seem somewhat well suited from the start, despite the circumstances, and she really does make you care about their potential future happiness. What is interesting here is that, whilst Flora is the eldest daughter of an Earl, Lachlan is plain ‘Mr. McNeill’, and his past, and how he made his fortune is hidden from society. Indeed there are some nice comic asides amongst the high society gatherings as rumours abound regarding Lachlan’s past. The truth is rather tragic though, and without spoiling the story, Lachlan’s confession to Flora about what he has been through is an emotional and exceptionally well written section of the book. Lachlan and Flora may initially seem like opposites, but it is interesting to note that they both believe their past to be the reason they seem to be outcasts from society. As the book progresses, the author seamlessly creates a strong believable romance which you can see developing into a meaningful marriage, and the fact that Flora is strong willed enough to fight for what she wants from her marriage makes her all the more likeable. As much as this is Flora and Lachlan’s story, and you really do root for them to get their deserved happy ending, this book also marks the start of the Lochmore Legacy, and the depth of mystery that is revealed paves the way for what should be a fascinating series of books. The prologue is a strong opening with a young Flora discovering a body, and a silver broach locked away in the tower of Castle McCrieff, and as we quickly learn, a centuries old feud between the McCrieffs and the Lochmores has long rumbled across the Highlands, causing family rifts across generations. The fact that Lachlan has recently purchased Lochmore Castle allows further exploration of it’s history, and the vivid descriptions of the castles and it’s surroundings give the reader a strong sense of place as we begin to unravel the mysteries of the past. It would spoil the story to say more about this, but as the revelations begin, the reader will be very keen to learn more. What I loved about the concept for this series when I first heard about it, was that, whilst it would start in the Victorian era, the following books would move backwards in time to reveal the history of Lochmore, and so, whilst this book neatly concludes Lachlan and Flora’s story, there are enough unanswered mysteries and the origins of the McCrieff/Lochmore feud to leave you keen to learn more about the past. Thank you to Janice Preston for a copy of this book in exchange for an honest review. The LOCHMORE LEGACY is an interesting series of four books which take place in different eras, but involve the same mystery. Rather uniquely, the stories start in the Victorian era, and each book goes backward in time, and reveals another piece of the puzzle. In book one, Flora McCrieff discovers a shocking secret in her family home. It’s something she can’t ask anyone about, as she was somewhere she was forbidden to be. Her marriage home leads to another discovery that appears related. While the mystery will wind through all four books, be assured that Flora and Lachlan will achieve their happy ever after in HIS CONVENIENT HIGHLAND WEDDING. The slowly developing love and attraction between Flora and Lachlan makes for wonderful reading. While outwardly strong and dynamic, Lachlan is suffering and feeling guilt over his family, as well as feeling unworthy of his wife. Flora’s family had always made her feel worthless, except for what value she could bring them through marriage. Lachlan and Flora are amazing people, who have a lot to offer each other and to the world. HIS CONVENIENT HIGHLAND WEDDING brings two wounded souls together, allowing them to heal, to make the world a better place, and to find genuine love with each other. I love this well written, warm, and romantic story, and look forward to the upcoming books in the LOCHMORE LEGACY. I have been looking forward to the Lochmore Legacy series ever since I heard that four of my favourite historical romance authors had teamed up to write four books in different eras with a common theme. Janice Preston's Victorian-era story is a great series opener. Flora and Lachlan bring a lot of baggage to their union. They are strangers when they marry and their route to happiness is a wonderful tale. They both trip over their baggage multiple times on their journey and their HEA is oh so sati I have been looking forward to the Lochmore Legacy series ever since I heard that four of my favourite historical romance authors had teamed up to write four books in different eras with a common theme. Janice Preston's Victorian-era story is a great series opener. Flora and Lachlan bring a lot of baggage to their union. They are strangers when they marry and their route to happiness is a wonderful tale. They both trip over their baggage multiple times on their journey and their HEA is oh so satisfying. Ms Preston's writing makes her characters come alive. This was a time of great change. The Victorians raced towards industrialisation and the future with little care as to how it was affecting the men, women, and children who were being sucked into their powerhouse of mechanisation. Janice Preston portrays the poverty and hopelessness simply and with just a few scenes; short though they are they carry a punch that makes His Convenient Highland Wedding something far more than a simple Harlequin romance. This is the first story in the Lochmore Legacy, which written by four different histo Set mainly in the Scottish Highlands and West coast, this story is full of rich imagery that makes it easy to visualise both the setting and the time period this story is set in. His Convenient Highland Wedding by Janice Preston is book One in The Lochmore Legacy Series. This is the story of Flora McCrieff and Lachlan McNeill. Flora turned down a Duke's marriage proposal which set her father off and open her eyes to their family need for money. Lachlan is looking to get his whisky business to do better and he needs a wife that has the connections to open some doors for him. Lachlan is willing to marry Flora site unseen due to her family connections, but of course the spar His Convenient Highland Wedding by Janice Preston is book One in The Lochmore Legacy Series. This is the story of Flora McCrieff and Lachlan McNeill. Flora turned down a Duke's marriage proposal which set her father off and open her eyes to their family need for money. Lachlan is looking to get his whisky business to do better and he needs a wife that has the connections to open some doors for him. Lachlan is willing to marry Flora site unseen due to her family connections, but of course the sparks fly when they do meet. Flora is unsure of Lachlan since he is a man of few words but they slowly start to learn more about the other. 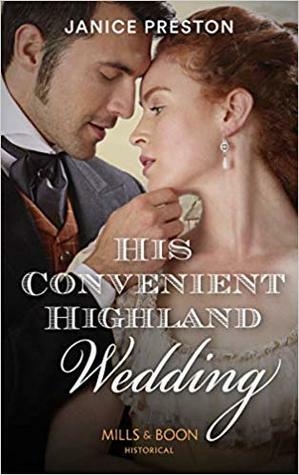 Book 1: His Convenient Highland Wedding by Janice Preston starts in 1841 in Castle McCrief were twelve year old Flora, one of the Earl’s daughters is feeling abit miffed with her father’s attitude towards her. Flora is a high spirited young girl and is full of ideas to help with the upkeep of the castle that is rapidly eating up the family’s wealth. Her suggestions have been rebuked so many times she feels dispirited. With her temper still seething Flora goes off for a wander in the castle to wo Book 1: His Convenient Highland Wedding by Janice Preston starts in 1841 in Castle McCrief were twelve year old Flora, one of the Earl’s daughters is feeling abit miffed with her father’s attitude towards her. Flora is a high spirited young girl and is full of ideas to help with the upkeep of the castle that is rapidly eating up the family’s wealth. Her suggestions have been rebuked so many times she feels dispirited. With her temper still seething Flora goes off for a wander in the castle to work off her steam but during this time she makes a startling discover that frightens her to her core. Seven years on and the discovery that Flora found still leaves Flora with a chilled fear and questions she’s been afraid to ask. But now the castle is in bad disrepair and her father has virtually sold her off to a stranger and she is set to marry a wealthy gentleman. A man she’s never seen or heard of before but his money is good for the family home. Lachlan McNeill is a ruggedly handsome man that has worked hard the last few years earning his wealth. He’s now bought himself a castle, a distillery and now a wife. His life is looking almost complete but there’s a hidden sorrow within Lachlan that he’s desperate to remedy. Life in the past was very difficult for Lachlan and his family and a tragedy has left him with a guilt he’s struggling to overcome. Outwardly Lachlan looks the perfect husband but he’s so overcome with the strain from the emotions brought on by his past that it’s placing a barrier against any future happiness with his wife. I loved this story set in the Scottish Highlands, Janice Preston described the setting perfectly and you could feel a sense of ruggedness of the land and the remoteness to the nearby city of Glasgow. Flora had two different personalities in the story, she was so vibrant as a young girl but by the time she was due to wed her father had knocked the spirit out of her. Once wed she was quite shy and reserved but her spirit from long ago was still there slowly simmering in the background. With secrets in both Flora and Lachlan’s past can the newlyweds help each other to overcome them? Will the feud from long ago lift it’s ugly head and what is the startling find that Flora discovered? His Convenient Highland Wedding is gorgeously romantic with a storyline that is filled with secrets, drama and charm. This is book 1 of the Lochmore Legacy and I'm hooked already!! What a splendid job Janice Preston did with this start of the series. So many emotions went through me while I was reading, my heart really went out to Flora and Lachlan! Lady Flora McCrieff is forced to marry a stranger (she meets Lachlan at the altar!) because her family needs money and after a year of being ostracized by her family for creating a scandal by refusing to marry a lecherous duke, her father has had enough and forces t This is book 1 of the Lochmore Legacy and I'm hooked already!! What a splendid job Janice Preston did with this start of the series. So many emotions went through me while I was reading, my heart really went out to Flora and Lachlan! Lady Flora McCrieff is forced to marry a stranger (she meets Lachlan at the altar!) because her family needs money and after a year of being ostracized by her family for creating a scandal by refusing to marry a lecherous duke, her father has had enough and forces this marriage on her. Lachlan McNeill, a business man, feels he needs a wife with a title so that he can be part of the ton and have rich men do business with him and his whiskey distillery. Unfortunately, he didn't know that Flora was not welcome and was being ignored by the ton. Lachlan has some secrets that he's keeping from Flora and many misunderstandings occur between them, leaving Flora hurt and exasperated that she can't seem to get through to him. All she's ever wanted was to be loved and have a family....Lachlan feels he's no good for her because he comes from a very poor childhood and has been to prison. A lot of heartache happens until Flora decides to fight back!! Tis another buy buy book! While I did not give it five stars for a small reason, this was a wonderful read. Had elements that were unexpected. Characters you could like and enjoy and written in a fashion that makes the reader want more. I had some frustration at times for I felt it needed a little boost in life but the overall story and the creative mind and writing of the author saved it to be a very good read. The plot of marrying to raise yourself in society while not a new one was carried ou Tis another buy buy book! Seven years later, Flora is about to marry a man she has never met. Lac His Convenient Highland Wedding is a Victorian romantic mystery and book one of The Lochmore Legacy collection. A set of four books, each steps back into history as clues to the secrets are recovered. Book two is set in the Regency era, book three in Tudor times, and the final book is set in the medieval period. Let's just take a second to admire the cover. Now, let's take a minute and freak out at the fact that a new Historical Romance series is here. Yeah... That's what I did when I found out about this series and book. You all know I love Historical Romance, especially Janice Preston's since she introduced me to this amazing genre with her book. Than been said, of course I was very excited about this all series because of the amazing authors that rote the books. This book is the start of everything. I Let's just take a second to admire the cover. Now, let's take a minute and freak out at the fact that a new Historical Romance series is here. Yeah... That's what I did when I found out about this series and book. You all know I love Historical Romance, especially Janice Preston's since she introduced me to this amazing genre with her book. Than been said, of course I was very excited about this all series because of the amazing authors that rote the books. This book is the start of everything. It's the introduction to a brand new series connected but separated by time. In this novel we are transported to a Victorian era and I know that it's quite a new era for Janice Preston and that she got out of her comfort zone, but she did an absolutely wonderful job with this book. Set in a beautiful place, with brilliant and vivid descriptions, the author completely transport us, not only to another time, but to another place as well. The setting of this novel left me dreamy, just as much as Lachlan made me feel. I felt as if I was part of this place, part of the story, even if only as a spirit running around the castle and the land, making sure my beloved family members were doing well and happy, in love too. Sounds, weird? I don't care, I was really transported and I loved the trip. So, yes... I loved the book. "Love" is the strongest word I can use at the moment. I'm still quite speechless. I loved connecting with the characters and I loved following their journey, uncovering mysteries (of life, of family, of love), surpassing obstacles and being who they are. Overall, this story of Flora and Lachlan was very good and captivating. But I gave it 4 stars rather than 5 because the author neglected to solve the mystery of the skeleton in the tower, the empty tomb and Flora’s brooch. Too many loose ends with these details and it just bugs me that the author leaves these details of the story just hanging. Review available on release day.